Analyzing Plastov’s work on the subject of his painting “The Troika. 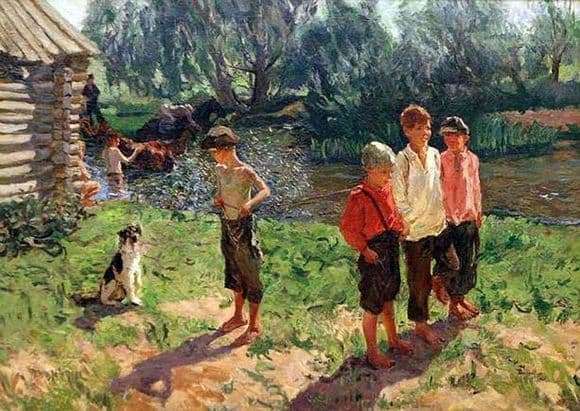 The kids at the river “, it is impossible not to note the fact that the artist has some special feelings for children, often using their images in their works. They are the main heroes of most of his masterpiece canvases. In this case, not only the image of the child itself is very vividly transmitted, but to everything else, the typical life of that time, where on the small river, someone washes horses, while others simply rest under the shadow of the spreading willow. Summer atmosphere, the children are barefoot, but not because it is warm, but because they most likely have no shoes. Generally, it is during this period that the artist begins to convey in his paintings typical household moments of the time, but it captures the very dramatic nature of life that makes one think. By the way, this period reached its peak in some of its very sensitive and emotional canvases of the Great Patriotic War. The plots of this artist are almost always very simple (however, like this time), but despite this, their expressiveness, naturalness, vitality in addition to masterful writing, makes of each work a real masterpiece. I am perfecting my letter, the master is constantly trying to know the structure of the form, thereby achieving maximum skill in this. Layer takes the most simple and traditional images from the life of Russia and makes this a full-fledged part of the artistic culture of the whole world. A distinctive feature of the picture are the emotions of children, which are transmitted exactly as they really are, without unnecessary artistic techniques that can enhance or accentuate them. The ease and simplicity of the canvas, makes me feel completely in the atmosphere of that time and feel the emotions that accompanied the author while writing the picture.